Professor Tariq Durrani OBE, and IEEE Life Fellow has been elected as a foreign member of the US National Academy of Engineering. He is among 16 new Foreign Members elected to the Academy this year from throughout the world, and is the first person from Scotland to receive such recognition since the Academy’s foundation in 1964. Professor Durrani was cited for his innovations in key areas of signal processing and leadership in engineering. 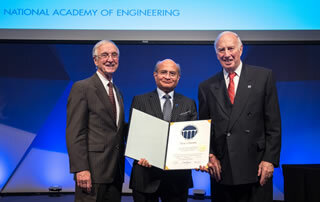 Photo: Professor Durrani receiving the Foreign Membership Certificate of the US National Academy of Engineering; flanked by Gordon R Englund Chairman (l) and Dr C Daniel Mote President of the US NAE (r). 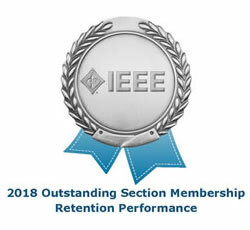 I’m enormously pleased to have been awarded this international recognition. The US National Academy of Engineering is one of the most prestigious in the world. It’s incredibly humbling. He was inducted into the Academy at a Ceremony in Washington in September this year. Professor Durrani has authored over 360 papers and nine books; and supervised some 50 PhD theses. He has been Vice President (International) of the Royal Society of Edinburgh, and Vice President for Educational Activities for the IEEE. He has been a previous Vice Chair Technical Activities for IEEE R8 and has been a past President of the IEEE Signal Processing Society and of the IEEE Engineering Management Society. He was formerly Deputy Principal of Strathclyde, overseeing staff development and the university’s IT and computing infrastructure and was Head of the Department of Electronic and Electrical Engineering. He was awarded an OBE in 2003 for his services to Higher Education and electronics research.